Possibly more than in any other circumstance, the necessity to do something effective for an eczema condition is when babies are suffering from it. Eczema is a condition that is known to be chronic (no medical cure is known at this writing) so the normal actions involve simply finding treatments that provide relief. There may be nothing more frustrating for a parent than trying to do something to give her or his baby relief – only to find out that “nothing works”. While some schools of thought recommend harsh treatment for skin (even for babies), it has been found that natural remedies for eczema tend to work just as well – or better due to the fact that this generally involves a “lighter touch” with sensitive baby skin. The basics include keeping skin clean – using mild soothing agents to cleanse – and applying a moisturizing cream or lotion to skin after cleansing (we encourage using a gentle, soothing all natural cream). As mentioned above, eczema is known to be a chronic condition – often children “grow out of” it, while sometimes adults are unfortunate enough to have to deal with it, and have since they were children. 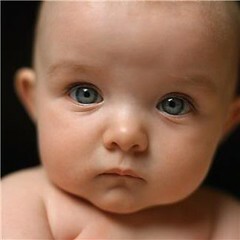 Some of the most common complaints having to do with eczema and babies include eczema on face, eyebrows, legs and scalp. Is there relief for babies with eczema? 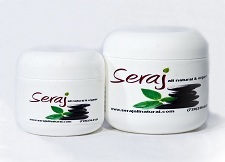 Seraj cream has had some rather amazing results in terms of eczema relief – per testimonials for our cream, those who try it specifically for the condition are quite happy with the results, and the ingredients we use are strictly pure, natural and organic. As mentioned above, there have been some very happy people who have used Seraj cream for skin conditions such as eczema (among other things) – and the ingredients we use are only pure and natural – and are known to be quite gentle and safe for babies. To try it, request a sample of our Citrus Cream or Floral Cream product. (Note: We have received a good amount of positive feedback on our Citrus Cream for eczema conditions.) – Click here for instructions on how to get a sample of our cream (a shipping and handling fee applies, amount based on your location). Perform a patch test with the cream – click here for instructions on how to perform a patch test. Cleanse the skin – using a gentle, all natural baby soap.